This is part of the Golden Mile and a very happening place to be. Long piers flank the edges and a leisurely stroll can be interrupted with a visit to one of the many food joints, public pools or the merry-go-round. You'll always find someone to talk to whatever time you choose to visit. It's a popular spot for swimmers, surfers, joggers, skaters and people walking their dogs. 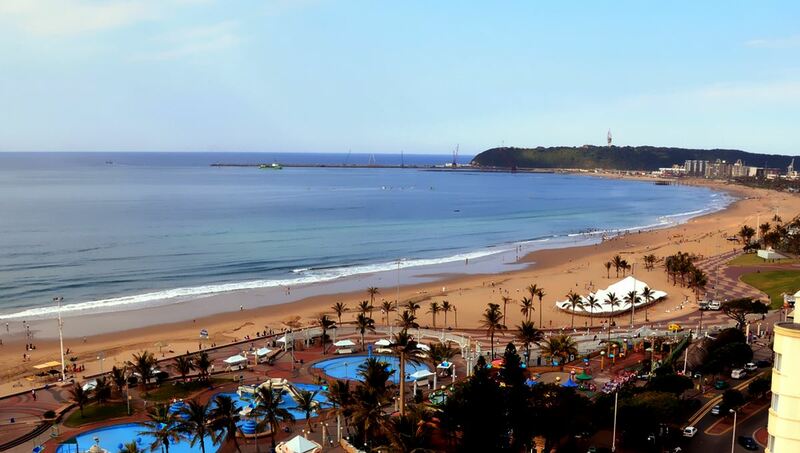 North of Durban, this beach has slightly choppier waters but is much quieter and trendier. It has a whalebone pier that has been dubbed one of the most beautiful piers in the world. There is a running path alongside the golden sands that leads from an iconic red and white lighthouse to iSimangaliso Wetland Park. This beach is also north of Durban but a little further out. It's a popular beach for locals who want to avoid the tourists. It has an enclosed lagoon-type swimming area with plenty of rock pools and an open section that can be used for surfing. If you visit early in the morning you might well get a glimpse of the beaches other visitors. Dolphins can be seen and also whales between July and November. This is considered by many to be a hidden gem. It's located in Blugg, just 10-15km south of Durban city centre. The water is much shallower and perfect for snorkelling, scuba diving and surging. This beach has a bit of history and is often referred to as the apartheid beach. This is because the pier in the south earned a reputation as a dividing wall. It's popular today for kayaking, kite surfing, surfing and the world class aquarium and water park. If you like the sound of these beaches you'll need somewhere to stay. Take a look at our top 10 suggestions. Located along Durban's north beach, just a 2 minute walk from the beach. The Palace has a restaurant and cocktail bar that offer panoramic views of the Indian Ocean and Marine Parade. Set in the Umhlanga, 20 minutes drive from central Durban and 16 minutes walk from the beach. It offers an outdoor pool and children's playground. Situated in Umhlanga Rocks this self catering accommodation is a short stroll from the beach. There is an outdoor pool and BBQ facilities. As well as a tennis court, garden and sauna. 3 minutes walk from the beach and featuring a rooftop pool and restaurant. There's a games room on site and an on-site bar. There is also a casino. A Mediterranean-style villa surrounded by a landscaped garden. Located in Umhlanga bordering the Lagoon Nature Reserve, this resort has a garden and terrace, outdoor pool and on-site restaurant. Activities include a fitness centre, games room and children's playground. Boasts an outdoor swimming pool, BBQ facilities and garden. All rooms have a patio with pool views. Located 200m from the beach this hotel offers an a la carte restaurant and is within walking distance of various local attractions. This is an eco-friendly hotel attached to the Gateway Theatre of Shopping. 20 minutes walk from the beach and located next to the International Convention Centre this hotel features an outdoor pool and fitness centre.